Summer is coming to a screaming halt for families all over the country. Did you notice the advertisements for school supplies everywhere? I covered Uncrustables as a start to the LUNCHBOX discussion. My children are exhausting. They are always demanding that the food in their lunchbox keeps changing. Would I love to pack carrot sticks every day? Yes! But, will they eat them every day? No! The list below is meant to augment the obvious stuff for lunch boxes (apples, grapes, bananas, veggie sticks, whole grain crackers, etc.). Hopefully, this list will inspire you to keep adding variety so your kids don’t start demanding the hamburgers and fries from the school cafeteria. I use this template to customize homemade granola bars! 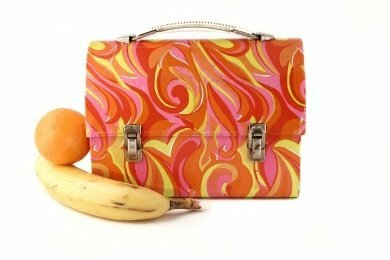 Great snacks and I am loving the lunch box, totally groovy!! My youngest starts kindergarten this fall, my oldest begins high school. I still make all their lunches. As much as I wish the older kids would make their own lunches, I shudder to think what they'll put in them or if they'll remember at all. This fall I'll be making 4 lunches instead of 3, and I don't mind. My kids haven't always been enamored of what is served daily at school, and I find I can make lunches for them at a fraction of what the school charges per meal. I give them guidelines each week and then let them decide what I'm making them for lunch. I.e. they know cheetos are not an option, but they can decide what type of deli meat I might buy or that they can bring mac 'n cheese that week (our school has a microwave for the kids to use). Since they tend to spy on each other I hear back if someone doesn't eat what I've packed and that helps me to tweak the menu. I am always looking to add variety to their lunches & snacks though! I have a preschooler and I asked her just this morning if she wanted Berry Kix in her lunch. She said no, she wanted the goldfish I would normally pack - no surprise there though. She gets the same basic lunch every day - PB&J sandwich, raisins, goldfish and fruit. (She gets very small amounts of raisins and goldfish.) I only vary which fruit she gets and she still will ask for the usual apple slices. I guess I should be happy she wants the same thing every day since it makes it much easier for me in the morning. I know that will change soon enough. I am so totally wanting that lunch box. The snack ideas are great also. Our 4 year old was just diagnosed with Celiac disease and we are going to have both older boys tested as well. The school year will be easier for her because we can just send her own snacks to preschool. Lunch for both boys will be a little more difficult. Do you have suggestions for gluten free lunch ideas for the boys. Their ages are 8 and 9. They don't go to a public school so each classroom has a microwave in it. One of them will try new foods the older one is more picky about what he eats. Thanks!! that is the coolest lunchbox ever!! To keep my kids' lunches interesting for both of us, I use the Laptop Lunches Bento Lunch Boxes. Their different containers and configurations encourage me to pack a variety of foods and not digging for tupperware and baggies makes it easier on me. Their site also has some great menu ideas. You should check them out: www.laptoplunches.com. Great lunchbox, fun and colorful! Where can we find it? How about ants on a log, apple slices with pb, cheese or sandwiches cut into fun cookie cutter shapes, turkey snack sticks, veggies and ranch dressing, homemade granola bars,trail mix, mini bagels spread with cream cheese, a thin apple slice and piece of cheese. This list looks great - especially the no bake lemon balls. Yum. Hard to believe that it is almost back to school time. Always good to mix it up in the lunchbox. My daughter loves having a voice in her lunchbox - she plans a week's worth of lunches in advance using my app, LaLa Lunchbox (which she helped design). It takes a lot of the hassle out of the morning rush for us. One quick healthy snack is a dried fig cut in half with either a bit of cream cheese or a bit of soy nut butter inside. Also works well with dates. My daughter loves these.